Houston indie pop band Polaroid Summer have bravely tackled the issue of substance abuse in their recent single “TIDES”. The video, which can be viewed on SUBSTREAM and Polaroid’s YouTube channel, portrays the different addictions that can creep up on anyone at any time in our society today. The poignant message within the lyrics isn’t all doom and gloom as “it’s a song about healing and how important it is to make a change for yourself”. “TIDES” isn’t the only single from Polaroid Summer, their debut single “The Giant” proved these guys are the real deal from the start earning them a place in the “Hot 100 acts of 2017’ list by Music Connection Magazine. 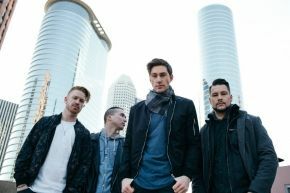 The band is made up of talents from previous Houston favourites, Lost Element and VerseCity, who both, after tirelessly touring and writing new music, decided to call it a day, however left VerseCity vocalist Micaiah Walker and Lost Element members Brian Barrett, Trace Sisson and Kenneth Conlon wanting more. This was the start of Polaroid Summer, who wasted no time in playing more than 80 shows in 2017, including festivals, college and headline shows, along with an appearance at the 2017 Musexpo in LA. Polaroid Summer’s debut EP is set for an epic release in the summer of 2018. Their alternative sound offers new age alt pop that gives them cross genre appeal. Their music, often related to that of the 1970’s, promises both electronic and organic elements combined with big propulsive beats, catchy guitar licks and a lavishly layered sound. The band hopes to release multiple singles from their EP, starting with their hit “TIDES” and currently the band has teamed up with Sat Bisla from A & R worldwide to help them catch some buzz before performing for the second time at MUSEXPO. You can listen to Polaroid Summer on Spotify, Apple Music and on their official Youtube channel.